Bush speaks up for America at the UN. Quit the terror - we want peace. It's the right message. Comments in the NY Sun. One thing should be kept in mind, however: The often violent protests that erupted in the Muslim world in the wake of the cartoon controversy have often been manipulated and fuelled by Islamists. The bile currently being flung at the pope is no different. But the attacks against the pope are especially grotesque. The severe criticism -- often coupled with threats of violence -- directed at the speech held last Tuesday by Benedict XVI is not just an attack on the head of the Catholic Church. The malicious twisting of the pope's words and the absurd allegations made by representatives of Islam represent a frontal attack on open religious and philosophical dialogue. That so many in the Muslim world joined the protests against the pope merely show just how influential Islamist extremist groups have become. The political goal of the Islamists is clear: any dispute between Christianity and Islam must obey the rules handed down by political Islamism. Bending to this demand would be a mistake -- indeed it would be tantamount to turning one's back on freedom of expression and opinion. What will come next? Perhaps a complaint that Allah feels insulted by the numerous European women who don bikinis during a summer trip to the beach. It could be anything really -- militant Islamists will always find something. But the response needs to be firm. Dennis Prager interviews Howard Zinn.� I won't quote from it, but you have to read it. Unbelievable.�They let this bozo write textbooks?�His knowledge of history seems so...um... incomplete. Or selective? Almost like he had an agenda or something? Shooting old women in the back, burning churches, and threatening the life of the leader of a billion Catholics is an excellent demonstration of Muslim �sensibilities� I must say. Cole�s analysis is spot on. Who woulda thunk it? All the burning, and killing, and screaming, and gouging, and stabbing is the fault of the West and our mean old ancestors who told the fanatic�s ancestors that their religion was dirt. Failing that, it is the legacy of those superior airs put on by the Brits and the Frogs that is causing our Muslim brothers so much pain. Of course, the good professor conveniently forgot to mention the most famous footstools in history � the Ottomans � and their bloody, inhuman rule over the Middle East. By the time Napoleon saw the pyramids, the Ottoman�s had made themselves at home in the region for nearly 300 years. Known as �the sick man of Europe� the Ottoman�s proved that they not only could out-atrocity the west on any given day, but also proved that they could be pretty damn good colonial oppressors themselves even when they weren�t feeling 100%. Of course, the Ottomans didn�t worship Jesus. They didn�t recognize the Pope�s authority. They never saw the inside of a synagogue (except to set fire to one), nor did they worship, Bal, Babel, Ra, Isis, or any other regional deity. They followed the teachings of the Prophet Muhammed. Don Surber makes the case FOR pork-barrel spending. Don - that argument is 100 years old, from the days when they didn't have so much of our money to play games with. It is ours, remember. We earned it. Your argument, Don, is that politicians are slimy jerks for whom the pork greases the wheels.� I am sure that that is true. the bottom line is simply that we in the western world don't act that way. We don't riot when insulted; we don't burn when inflamed. That difference is what we in the West naively call civilization. We tend to assume that all people want to be civilized. The enemies of civilization don't. They want to kill us. For things like looking at the wrong pictures. For quoting obscure Byzantine emperors. And what do we do? Image: That would be a�Jersey Cow. 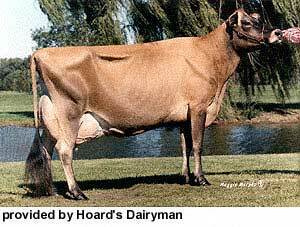 A good looking, smaller, and manageable�breed of dairy cattle. Read about their history here.